Spectral opens with Jewel having no idea what she is. As far as she’s concerned, her father did something when she was a baby and they have been in the witness protection programme ever since, often having to run for their lives in the spur of the moment. They are constantly on the run and moving from place to place. So, she is somewhat surprised to come home from school one day to find her grandmother and an aunt and uncle at her house. When she overhears them having a conversation about her being the Spectral and coming into her powers on her 17th birthday, one month away, she doesn’t know what they’re talking about. Then she meets the hot new guy at school, Roman. 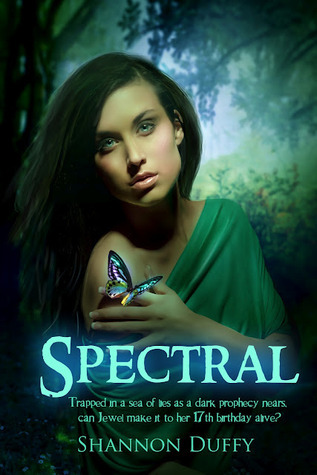 He tells her that he’s her guardian, that she’s in danger, and he explains to her what the Spectral is. For the most part, Jewel was an ok, likable character. She seems fairly smart and able to quickly accept things and work things out for herself when required. But then, she comes up with a really stupid reasoning, and follows this up with some stupid actions that had me really mad while reading, at this point to be honest, I felt like giving up. Thankfully, she eventually figures out her mistake. In my opinion it was out of character for her. There is kind of a love triangle, but personally, I didn’t feel I ever learned enough about Chase to have any strong feelings for him so Roman was always the guy I was rooting for. Though I think it was always obvious the direction it was going to take. Roman was a good character and I liked him more than any of the others, but I couldn’t say I had a deep connection with any of them. The relationships move very quickly to start with but do ease off somewhat so that I couldn’t really say its insta love. But not an enjoyable build up either. Despite my negativity so far, the overall storyline is quite enjoyable and imaginative. Shannon has a decent writing style and the book had a nice flow. The ending is good with some fast paced action, but also some sad scenes. Spectral was overall, a fairly enjoyable read. Shannon Duffy writes MG and YA. She is repped by the amazing Lauren Hammond of ADA Management. She grew up on the beautiful east coast of Canada and now lives in Ontario, Canada. She is a mom of one boy, her angel. She loves writing, reading, working out, soccer, and the sport of champions-shopping. My YA Paranormal romance, SPECTRAL is out now, and my upcoming middle grade fantasy novel, GABRIEL STONE AND THE DIVINITY OF VALTA, is set to release January 1st/13. Eeep this makes me cringe! Jewel sounds incredibly frustrating I'm not sure I would like her, and with a love triangle I have to understand and feel why it's needed. Why does this girl feel an attraction towards both in a way that makes her unable to choose or the reader to decide a team. So yeah, I love the cover though!! I get annoyed with the main characters when they keep making stupid mistakes; it definitely takes away from the book. Great review! Huh. Very interesting review Suzanne. I've been wanting to read this book, but seeing how you were upset at the book and nearly gave up, idk.... ? I'll have to consider it thoroughly before I decide to purchase :) Great review! Great review. Loving the cover for this book! Suzanne, thanks for taking the time to read and review Shannon's book. I'm glad that you found it to be quite enjoyable and imaginative. The storyline does sounds neat. Thinking you are in the witness protection program when all along you were a special witch in hiding. I do hate when the romance is underdeveloped but as you said does sound like a unique story anyway. Curious as to what happens when she comes into her powers and who will be after her. Nice review!